Keystone B-3A (S/N 30-281), the first B-3A built. 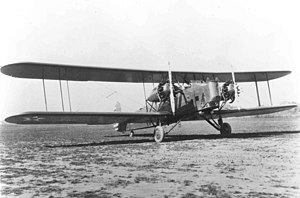 The B-3 was originally ordered as the LB-10A (a single-tail modification of the Keystone LB-6), but the Army dropped the LB- 'light bomber' designation in 1930. Although the performance of the B-3A was hardly better than that of the bombers flown at the end of World War I, it had come a long way. In terms of its safety, it was far superior to its oldest predecessors. The B-3A was a member of the last family of biplanes operated by the US Army; it remained in service until 1940. A few years after it was first produced, the introduction of all-metal monoplanes rendered it almost completely obsolete. The last of the 17 LB-6s ordered (S/N 29-27) was converted with a re-designed single fin and rudder and two 525 hp Wright R-1750E engines. Delivered to Wright Field on 7 July 1929, it was wrecked on 12 November 1929. This version used Pratt and Whitney R-1690-3 Hornet engines and was slightly smaller, in both wingspan and fuselage. A total of 63 were ordered (S/N 30-281/343). All were re-designated as the B-3A before any deliveries were made, with the final 27 built as B-5A with Wright engines. Ordered as LB-10A, 36 delivered as B-3A (S/N 30-281/316). The first aircraft was delivered in October 1930. Ordered as B-3A, re-engined with Wright R-1750-3 Cyclone engines, 27 built (S/N 30-317/343). ^ "Fact Sheet – Keystone B-3A." National Museum of the United States Air Force. Retrieved: 14 July 2017. The Illustrated Encyclopedia of Aircraft (Part Work 1982–1985). London: Orbis Publishing, 1985, p. 2255. Wikimedia Commons has media related to Keystone B-3.